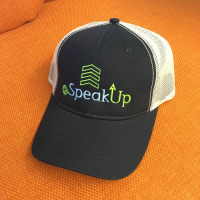 CKG SpeakUp Trucker Hat — $25.00 ea. CKG SpeakUp5k Race Hat — $5.00 ea. SpeakUp comfortably in this kiwi green race hat by HeadSweats! This race hat features lightweight, mesh panels for optimum airflow, a sweatband for comfort, an adjustable buckle closure for a custom fit, and black fabric under the visor to reduce glare. CKG SpeakUp Technical Socks — $15.00 ea. 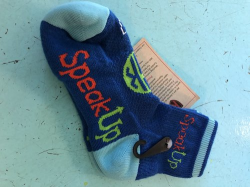 CKG SpeakUp Cycling Socks — $8.00 ea. Your feet can feel the CKG love with these custom SpeakUp socks by King Technical Apparel! These moisture wicking socks are approved by professional cyclists and weekend warriors, alike. Fight Finish Faith Bracelet — $15.00 ea.